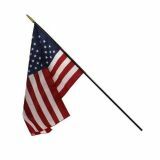 Heritage U.S. Classroom Flag, 12" x 18"
For use with the Heritage US Classroom Flag. Ideal for auditorium, stage, or parade use. 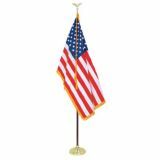 Set includes nylon sewn, embroidered and fringed 3' x 5' flag, cord and tassels, 8' polished oak pole with gold tone aluminum eagle ornament and gold tone floor stand. Ideal for auditorium, stage, or parade use. Set includes nylon sewn, embroidered and fringed flag, cord and tassels, polished oak pole with gold tone aluminum eagle ornament and gold tone floor stand.